Just like fish and chips, a roast dinner and a good cup of tea, the UK and Ireland are known around the world for our love of pubs and the unusual names that go with them. From White Horses and Red Lions to Queens Arms and Kings Heads, there’s plenty to choose from. However, while there’s no shortage of rare and quirkily-named pubs, there are certain names you seem to come across time and time again. But which is the most popular pub name of them all? And is this the same around the UK and Ireland, or does it vary from one county to the next? To find out, we compiled a list of over 58,000 pubs from across the UK and Ireland, highlighting the most popular names around the country. Coming out on top was The Red Lion, with a whopping 517 pubs on our list going by this name, followed by The Royal Oak, with 403 appearances. Below, we’ve listed the most commonly found pub names around the UK and Ireland. What’s the most popular name where you live? Showing its love of the Royal Family, Great London’s most popular pub name is The Prince of Wales, with 29 drinking establishments with this name being found across the capital. Travelling further north, the most popular name in Greater Manchester is The Railway, which could be due to the city being home to the world’s first scheduled passenger railway service. Heading over to Wales, the people of the Vale of Glamorgan are hoping for good luck, with The Three Horseshoes being the most popular pub name in this county. Up in the Scottish Borders, you’ll find more pubs called The Cross Keys than anything else, while over in Northern Ireland’s County Down you’re most likely to come across somewhere called The Bridge. 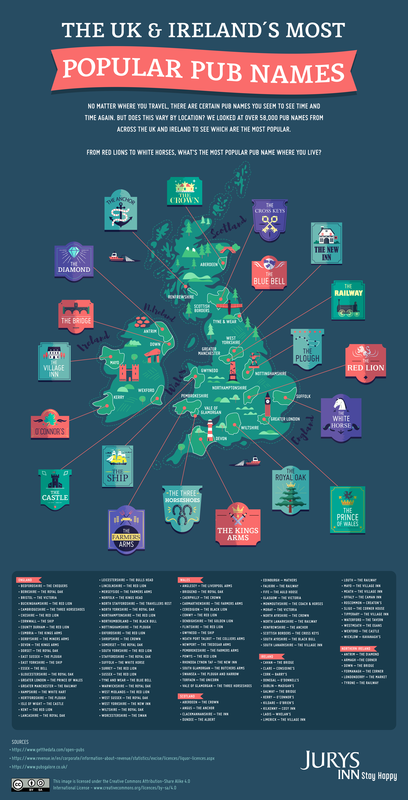 Fancy travelling to find your favourite-named pub? Book your stay today with Jurys Inn.